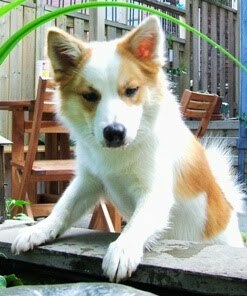 Three Icelandic Sheepdogs live with us. Our females, Sóley and Tindra are retired from breeding, but we have had the privilege of raising three litters. All of the pups have grown into great companions, who get a lot of time and attention from their owners. Like typical Icelandic Sheepdogs, they actively enjoy life and many of them participate in dog sports. Sòley and Tindra are full-time companions and training partners in CKC and UKC Conformation, agility, and have trained in herding, tracking, scent detection and disc dog. They accompany us to work on a regular basis and are super ambassadors for the breed. Elska lives on Vancouver Island, B.C. and is a beloved family dog. 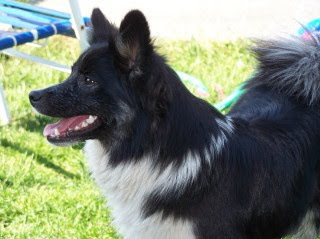 She has competed in CKC conformation showing and trained in agility and flyball. 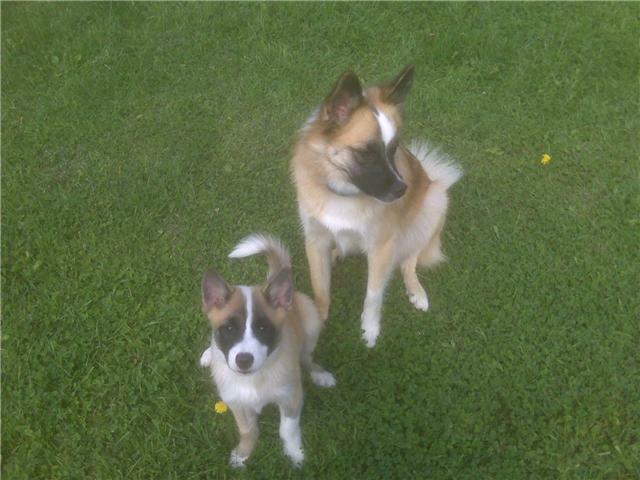 Elska has had two litters, each of five lovely puppies, under the CKC kennel name Eagleisle. 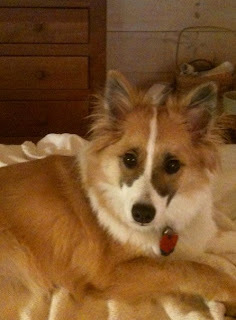 Disa is owned by Lisa Richards, at Mack Hill Farm in Vermont, where she is a full-time farm dog and working companion, just what the breed is meant to be. Disa’s second litter was co-bred by her owner, myself and Monika Karlsdottir (Iceland). One of those puppies is living at Halter Icelandics in Ontario and another puppy, Mack Hill Roki Alberta Boy, has had a successful show career in Alberta, Canada. Two of Disa’s daughters remain at Mack Hill Farm. 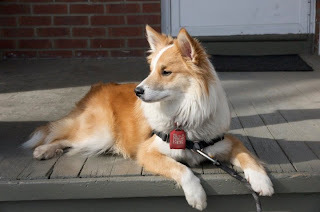 Leika lives in Toronto and enjoys time at the cottage as well. She has the typical traits of protecting the property from large birds and also chases away deer. Leika’s owner is of Icelandic descent and Leika is very popular with the Icelandic Canadian Club of Toronto. Leika has been shown a couple of times and won Best Puppy in Breed at the 2008 Canadian breed club booster show. Leika has had one litter of 8 puppies and her owners kept the adorable Oskar from this litter. Skonsa lives at Golden Pond Icelandics in New Hampshire. She has competed in CKC and AKC shows, enjoys playing disc, and is the proud mother of four beautiful puppies. Sigga is the reason we bred our 2009 litter, as Max’s owner Maureen really wanted a puppy from Max and Soley, but couldn’t take one at the time of the 2007 litter. Sigga is a sweet and loving companion to Maureen and a great sidekick for her sire, Max. Ari was bred by Sharon Schaefer, Belglen Kennel in Saskatchewan, and co-owned by myself, Sharon and Alisha Johnson for his first 2 years. Now known as Heart, he is in a full-time training/sports home in Muskoka, Ontario. Ari sired a litter with Elska (Eagle Isle 2010 litter) and we look forward to a future litter sired by Ari when the time comes that we have another female to breed. Kona and Trek live together with a wonderful family in Ontario. Viggo lives in Toronto with a very dedicated pair of owners.